BMW is celebrating its triumphant return to DTM with a new special edition of the M3. The BMW M3 DTM Champion Edition will be very limited with only 54 examples being made. They cost $130,000 here in the states, so dig deep. The car is painted in Frozen Black Metallic, with matte black wheels and BMW racing stripes. Hit the jump for more pictures and the press release. One thing I have to say about special edition cars is that they are generally boring. Such is the case here with the M3 DTM Champion Edition. First, check out the car it’s commemorating. Second, go back and look at the photo of the street version. Where are the fins, winglets, and other aero bits? Of course I know it’s a street car, but you’d think that for 130k they could spice it up some? BMW M celebrates DTM triumph with BMW M3 DTM Champion Edition model. 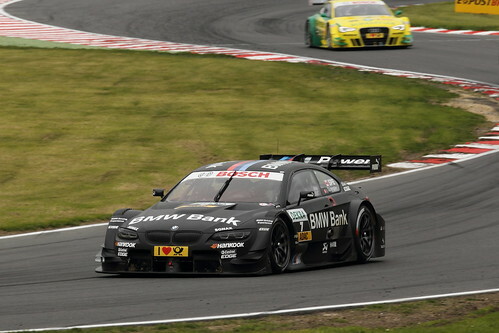 Munich, Germany – December 5, 2012… BMW Motorsport returned to the DTM in 2012 after almost 20 years away, and the results in its comeback year exceeded all expectations. Canadian driver Bruno Spengler won the drivers’ title, BMW Team Schnitzer finished in top spot in the team standings, and BMW claimed the manufacturers’ honours. BMW M GmbH is celebrating this success with the unveiling of the BMW M3 DTM Champion Edition. Mimicking the looks of Spengler’s racing car, this special-edition model is available exclusively in Frozen Black metallic, while the carbon flaps and gurney, various dark chrome elements, matt black wheels and sections of the race car’s livery also betray its close links with the triumphant BMW M3 DTM. The theme is continued by the BMW M stripe design over the CFRP roof and boot lid, BMW M logo to the rear of the front wheel arches and decals in the rear side windows. Inside the car, the door sill strips replicate Spengler’s helmet design and the carbon-fibre interior trim strip bears the newly crowned champion’s signature and the car’s serial number. The special-edition model also contains various exclusive interior additions, such as the Alcantara® steering wheel, handbrake lever embroidered with “M Power” lettering, and extended black Novillo leather trim with features in contrasting Palladium Silver. Technical elements like the Competition package, M Drive, M DCT Drivelogic and the M Driver’s Package underline the car’s focus on high performance. Equipment including the Professional navigation system, heated seats and Park Distance Control add more “everyday” ingredients to the model. BMW M is also offering the 54 new custodians of the BMW M3 DTM Champion Edition – which will be available in various international markets – a very special extra. Owners of this automotive rarity will have the chance to attend the BMW M Fascination Nordschleife driver training course under the watchful eye of Bruno Spengler. One of the most coveted elements of the BMW Driving Experience programme, the course is held on the Nürburgring’s legendary Nordschleife track, where BMW M cars are put through extremely exacting testing sessions and final chassis tuning is carried out. The BMW M3 DTM Champion Edition will be built at BMW’s Regensburg plant and the BMW M GmbH factory from February 2013. Prices in Germany start from €99,000.00 including VAT. The BMW Group is one of the most successful manufacturers of automobiles and motorcycles in the world with its BMW, MINI, Husqvarna Motorcycles and Rolls-Royce brands. As a global company, the BMW Group operates 29 production and assembly facilities in 14 countries and has a global sales network in more than 140 countries. In 2011, the BMW Group sold about 1.67 million cars and more than 113,000 motorcycles worldwide. The profit before tax for the financial year 2011 was euro 7.38 billion on revenues amounting to euro 68.82 billion. At 31 December 2011, the BMW Group had a workforce of approximately 100,000 employees. The success of the BMW Group has always been built on long-term thinking and responsible action. The company has therefore established ecological and social sustainability throughout the value chain, comprehensive product responsibility and a clear commitment to conserving resources as an integral part of its strategy. As a result of its efforts, the BMW Group has been ranked industry leader in the Dow Jones Sustainability Indexes for the last eight years. I know stereotyping is bad, and I try my best most of the time to consciously not do so, but read the last half of the press release and you will understand firstly the kind of people who buy these cars, and secondly the type of people BMW is directing this special edition toward. I don’t think it matters how spicy the car looks or how well it drives, the fact that it is a collectible edition made in very limited numbers means that BMW will have money thrown at them. And I’m all for that, if it means they’ll use that money to develop more every-man cars with racing spirit.